Georgia's peach industry has a long tradition and Peach County put the Peach in Georgia! The first peaches were planted in the state in the 18th century, and the first commercial production occurred in the mid-19th century. Georgia is widely known as the Peach State and Georgia peaches are arguably the sweetest and tastiest grown anywhere in the world, Georgia ranks third nationally in acreage devoted to peaches (with 11,500 acres in 2006) and in production (behind California and South Carolina). The Georgia peach crop averaged 86 million pounds per year between 2006 and 2010 and brought in $47 million in 2010. Georgia's peach industry is concentrated in Peach, Crawford, Taylor and Macon counties along the fall line, the transition zone between Georgia's Piedmont and Coastal Plain. This area is far enough north to receive sufficient winter chilling, but far enough south to avoid late frosts and guarantee early harvest dates. The early harvest allows premium prices for the crop. Additionally, the sandy loam soils of the fall line are more favorable to peach production than the Piedmont's heavy clays or the Coastal Plain's sands. Fresh Georgia peaches are available only 16 weeks each year, from mid-May to August. Georgia enjoys important production and marketing advantages, primarily its proximity to eastern markets and favorable prices because of early harvests and high-quality fruit production. Nearly all peaches grown in Georgia are sold in the wholesale fresh market, with a small percentage sold locally at packing houses and fruit stands. First grown in China almost 4,000 years ago, peaches spread from their homeland to the western world via India and Persia where they were first cultivated. Peaches were later introduced into Europe and Christopher Columbus brought peach seeds to the new world on his second and third trips. These seeds eventually found their way to the red clay soil of middle Georgia where they were planted on acres of land which would later become Peach County. Though peaches were originally planted in St. Augustine, Fla., Franciscan monks introduced them to St. Simons and Cumberland islands along Georgia's coast in 1571. By the mid-1700s peaches and plums were cultivated by the Cherokee Indians. Before the Civil War, increasing numbers of home orchards were planted in Georgia. Raphael Moses, a planter and Confederate officer from Columbus, was among the first to market peaches within Georgia in 1851 and is credited with being the first to ship and sell peaches successfully outside of the South. His method of shipping peaches in champagne baskets, rather than in pulverized charcoal, helped to preserve the flavor of the fruit and contributed to his success. Considerable expansion of peach acreage occurred in the late 19th and early 20th centuries, resulting in an all-time high production of almost eight million bushels by 1928. Since then production has decreased to about 2.6 million bushels annually. 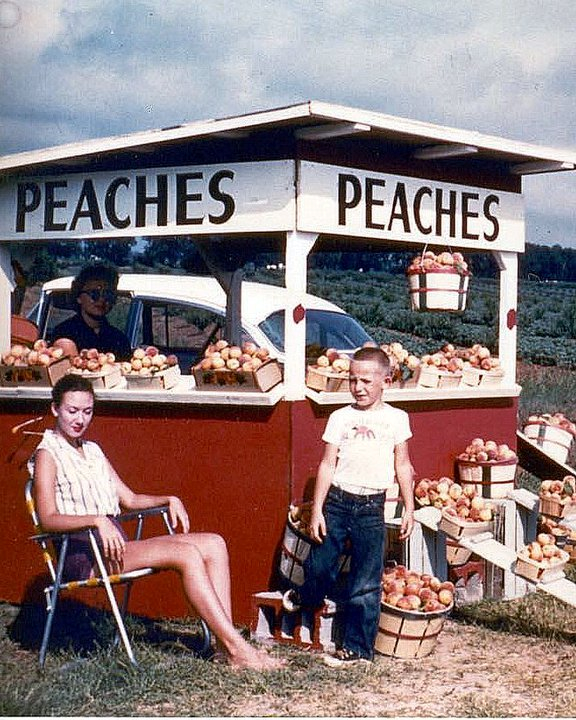 The first Georgia peaches were shipped to the New York market between 1858 and 1860. They were transported by wagon to Augusta, then by shallow-draft boat to Savannah, and finally by steamship to New York. Georgia earned its "Peach State" designation during the three decades following the Civil War. Peach expansion in acreage and production was fueled by several factors. The abolition of slavery forced farmers to search for alternatives to the traditional labor-intensive cotton crop. Peaches, in particular, benefited from this transition. The Georgia State Horticultural Society, founded near Augusta in 1876, promoted the introduction and testing of many fruit varieties and their distribution throughout the state while under the leadership of Prosper J.A. Berckmans, a nurseryman and pomologist. The old Fruitlands Nursery is now the site of the Augusta National Golf Club, home to the annual Masters Tournament. Berckmans became famous for introducing new fruit varieties that were more suitable for growing in southern climates. He developed or improved many types of peaches and eventually became known as the "Father of Peach Culture" across the South. Among his varieties were the South Chinese (or Honey) peach and the Chinese Cling. From the Chinese Cling, Prosper eventually bred the Elberta, Belle and Thurber peaches, which became Georgia's primary commercial varieties. His Thurber peach was the leading variety until it was replaced by the Elberta, which was later improved by Samuel Rumph. 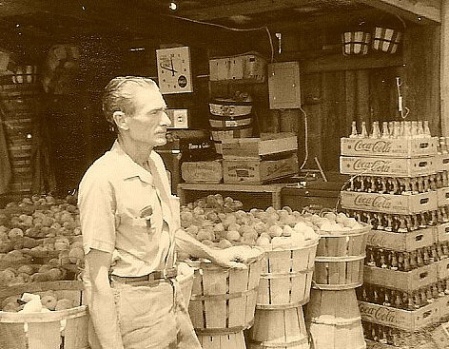 Rumph, a Marshallville peach grower, perfected the new peach variety in 1870, which he named for his wife, Elberta. This yellow-fleshed peach was of superior quality and shipped better than previous varieties. Elberta remained the leading peach in Georgia until 1960, but newer varieties have since replaced the Elberta in commercial use. Although the Elberta remains the most famous peach name, Georgia now produces more than 40 commercial varieties ... and the Elberta is not one of them. Rumph also pioneered improvements in rail transportation and the development of the refrigerated rail car which allowed rapid shipments to northern markets on a large scale.